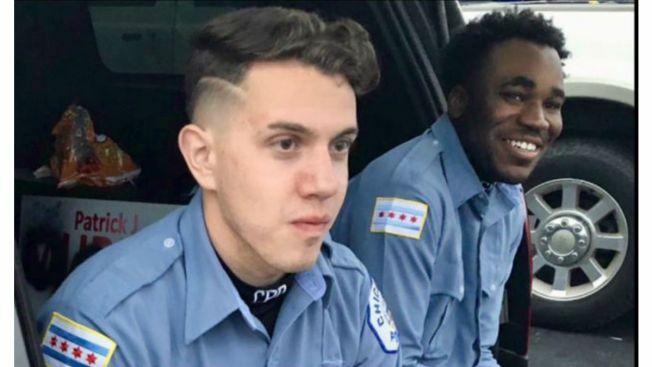 Chicago police officers John Rivera (left) and Nate Smith (right). Chicago police shared a heartfelt and emotional note Thursday from the partner of a recently slain officer. Officer Nate Smith worked with Officer John Rivera, who was fatally shot in what appeared to be a random attack in the city's River North neighborhood early Saturday, according to police. CPD's 14th District Twitter account shared a note from Smith paying respect to his fallen "brother," who he said was one of the best friends he ever had. "Words can’t even being to express the emotions, pain, sadness, and hurt in my heart," Smith wrote, saying their friendship was the type that everyone should want to have. "Sitting here I can’t think of a dull moment we ever had. All I can think of is moments of laughter and funny times," he added. "And those memories I’ll always hold dear to my heart." His letter can be read in full, as published, at the bottom of the page. Rivera, 23, was sitting with three other people in a parked Honda Accord in the 700 block of North Clark Street at around 3:30 a.m. Saturday when two men approached the car, according to police, who said one of the suspects opened fire on the car before they both fled the scene. Two people were charged with first degree murder in connection with the shooting, authorities said Monday. Rivera had been with the department for about two years, police said, and had worked his shift the night before, handling the paperwork on a murder case. Police said the accused gunman killed "the first Hispanic man that he came into contact with" after an unrelated altercation with a group from a party bus at the nearby Rock N' Roll McDonald's. “This appears to be an unprovoked attack against a group of individuals who went out to unwind on a Friday night,” Chicago Police Supt. Eddie Johnson said at a news conference Saturday. Johnson called Rivera "the kind of officer that we want in Chicago. Hard-worker, who loved going out on patrol and solving problems...he helped investigate a tragic murder, helped console a family on an unthinkable loss." Rivera was scheduled to be laid to rest in private funeral services followed by a police procession Friday morning. Words can’t even being to express the emotions, pain, sadness, and hurt in my heart. John you weren’t just a coworker, you were one of my best friends I’ve ever had. And I’m always going to remember you and thank you for that. We see it so often how lightly people say the word ‘friend’ but man I mean it from the bottom of my heart you were a true friend and we had the type of friendship everyone should want to have. Sitting here I can’t think of a dull moment we ever had. All I can think of is moments of laughter and funny times. And those memories I’ll always hold dear to my heart. I’m going to miss you always calling and texting me all the time asking for advice; no matter if it was life stuff, work related, or just things you were thinking about. I always wanted to give you the best advice possible because you were like a brother to me and I just wanted what was best for you. Or how we would always try to push each other to want and do better. Even though you’re life was violently taken away from you and us far too soon. I thank God for bringing us into each other’s lives. You were my right hand man my someone I could always count on. At work if I came in not feeling the best mood, I knew the moment we got it that car or started talking all my problems seems to disappear. Now that you’re gone I pray you Rest In Peace. Until I see you again I love you Brother.